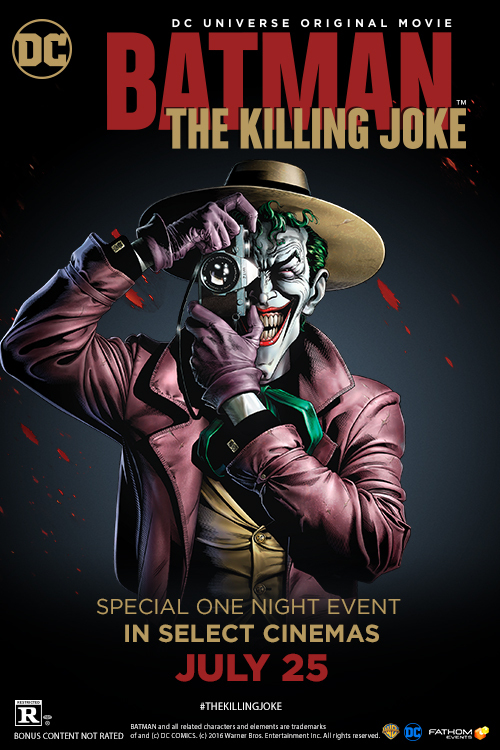 Fathom Events, Warner Bros. and DC Comics invite you to a premiere event when Batman: The Killing Joke comes to select cinemas nationwide for a special one-night event on Monday, July 25 at 7:30 PM EST. Fill in the entry form below, and we'll select one five (5) winners to receive a pair of passes to see Batman: The Killing Joke on the big screen at Regal Majestic in Silver Spring, Maryland on Monday, July 25, 2016. The winner will receive their passes via e-mail. All entries must be received before Wednesday, July 20th at 11:59 PM EST, so act fast. Good luck! Batman: The Killing Joke reunites the foundation of Batman: The Animated Series with Bruce Timm returning as executive producer, and actors Kevin Conroy and Mark Hamill reprising their seminal roles as Batman and the Joker, respectively. 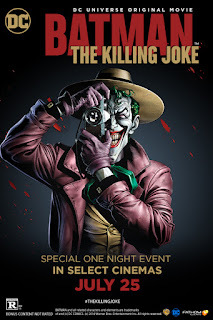 Based on the acclaimed DC graphic novel of the same name, Batman: The Killing Joke takes a journey into the dark psyche of the Clown Prince of Crime - from his humble beginnings as a struggling comedian to his fateful encounter with Batman that changes both of their lives forever. Years later, and now escaped from Arkham Asylum, The Joker devises a plan to prove that one bad day can make anyone as insane as he is - setting his sights on Commissioner Gordon. It’s up to the Dark Knight to put a stop to The Joker’s latest scheme and save one of Gotham City’s finest. Following a gripping prologue introducing Barbara Gordon’s heroic adventures alongside Batman as Batgirl, Batman: The Killing Joke stays true to the authentic tale that has held fans’ imaginations for nearly three decades - spotlighting the birth of a Super-Villain, the fortitude of a Super Hero and the punchline that will leave you speechless. Be among the first in the world to see the epic, #1 New York Times best-selling graphic novel come alive on the big screen! Special Fathom Feature: Experience a special introduction from Mark Hamill, plus a never-before-seen documentary about how Hamill was cast in this project and what the role means to him as an actor and a fan. The event will conclude with a special behind-the-scenes look at how the Joker’s memorable, yet disturbing song and dance number was recreated for the film. Not feeling lucky? In a hurry? Click here to purchase tickets. Visit FathomEvents.com for participating theaters and ticket information.